As we reach the middle of September, we also reach Holy Cross Day. Holy Cross Day is a major feast day in the Episcopal Church that has ancient roots, but only was added to our liturgical calendar in 1979. The feast of The Holy Cross can be found in both the Orthodox and Roman Catholic traditions, and traces its beginning back to the 4th century. The feast of the Holy Cross, also known as “the exultation of the Holy Cross” and “The Triumph of the Cross” celebrate Christ’s self-offering on the cross for our salvation, but in a more joyful context outside the somber atmosphere of Lent. Over the summer, I had the great opportunity to train as a catechist for the Montessori-based faith formation program, Catechesis of the Good Shepherd. In my studies, I learned that our main goal for children in their beginning years is to make them fall in love with their shepherd, Jesus, and to find great joy and comfort in their faith. When speaking of the crucifixion, it is always followed by his resurrection, so that the joy of the moment of triumph is the focus – not suffering. This concept has greatly helped me as a mother of young children, because I often feel at a loss for words when trying to explain the crucifixion in the midst of the sorrow of Lent. Holy Cross Day offers us a more joyful and instantly triumphant opportunity to introduce the concept of Jesus and the cross to little ones by celebrating the meaning of the sacrifice instead of concentration of the painful process of it. Of course, when asking questions to children under the age of seven, we are mostly posing the questions for them to mull over instead of giving concrete answers. However, you might find yourself bowled over by the answer you get! At church on Holy Cross Day, you might even decide to go on a bit of treasure hunt to see where you can spot a cross within the building, or on the church grounds. This is a wonderful opportunity to explain to your child that the cross is the sign of Jesus and for Christians, a sign of blessing. Expanding on that idea, Holy Cross Day would be a wonderful time to explain the holy water font near the door of the church, or within your own home. 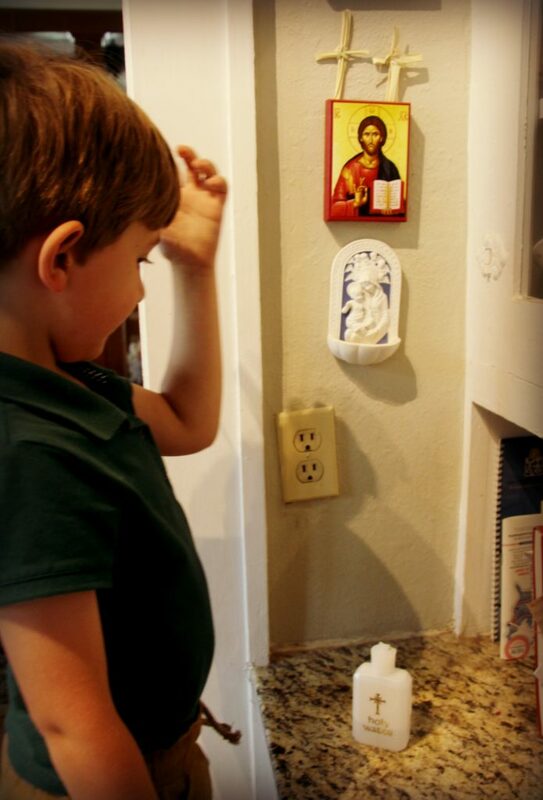 Explain to your child, and by example, how to make the sign of the cross. You can let them know that by making this gesture, we are marking ourselves as blessed by God because of Jesus’ sacrifice on the cross. And when we see the priest make this sign in front of the whole church, they are blessing everyone in the room. If you’re in the mood for some merry-making, you can always make a batch of hot cross buns or decorate the top of a cake— or even a pizza, quiche, lasagna, anything really, with a cross. This is not a day with a set of concrete rules for how to celebrate. However, I think it’s the perfect occasion to gently introduce your child to the Holy Cross, the sign of the cross, and why this symbol is meaningful to their church and family. They may not have the words to articulate much about the cross, but they will listen and internalize. Therefore, it is important that we teach them early about what a sign of love and blessing the cross is, and how to use it within their every day life.